San Diego, Calif, September 12, 2018 – Released to mark Sepsis Awareness Month in September, Sepsis Alliance’s annual sepsis awareness survey, conducted by Radius Global Market Research, reveals awareness of the condition reaches a new high with 65% of U.S. adults reporting they have heard the term sepsis, compared to 44% four years ago. On the contrary, the survey results also show that sepsis symptoms are not well known and there is a lack of urgency in seeking medical attention, despite sepsis taking more than 270,000 lives a year in the U.S.
Mortality from sepsis, the body’s life-threatening reaction to an infection, increases by as much as 8% for every hour that treatment is delayed. As many as 80% of sepsis deaths could be prevented with rapid diagnosis and treatment. Yet while 3 in 4 people strongly agree it’s important to respond urgently to signs of a stroke, only half would do the same for signs of sepsis – despite it being twice as common and deadly as stroke. That’s why Sepsis Alliance created It’s About TIMETM. Sepsis Alliance has partnered with 11-year-old Angelica Hale, America’s Got Talent finalist and sepsis survivor, to spread awareness of this initiative. On September 13th, Angelica will receive the Erin Kay Flatley Spirit Award at the 7th Annual Sepsis Heroes gala. This award recognizes Angelica for using her voice, as a Sepsis Celebrity Advocate, to help raise awareness of this deadly illness. At the gala, Angelica will perform an original new song “No Time to Waste,” an anthem she wrote that embodies her experience surviving sepsis. 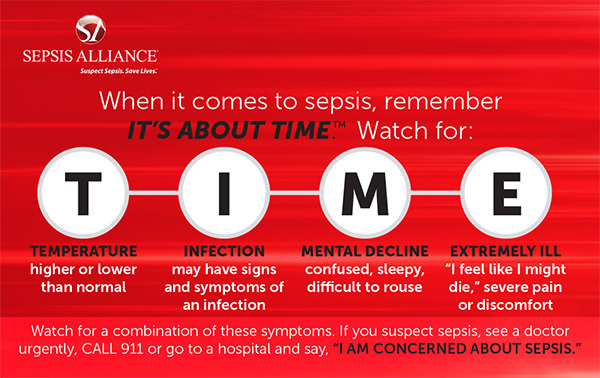 To learn more about sepsis and the It’s About TIMETM national initiative, visit www.SepsisItsAboutTime.org. The 2018 Sepsis Awareness survey results can be found at www.sepsis.org/2018-sepsis-awareness-survey/. The survey was conducted online within the United States by Radius Global Market Research on behalf of Sepsis Alliance between May 5 – May 8, 2018, among more than 2,000 adults living in the U.S. The results were weighted to the U.S. census for age, gender, region, and income. Surveys were conducted in English. Sepsis Alliance is the leading sepsis organization in the U.S., working in all 50 states to save lives and reduce suffering by raising awareness of sepsis as a medical emergency. Sepsis Alliance is a charitable organization run by a dedicated team that shares a strong commitment to battling sepsis. In 2011, Sepsis Alliance designated September as Sepsis Awareness Month to bring healthcare professional and community members together in the fight against sepsis. The organization was founded in 2007 by Carl Flatley, DDS, MSD, whose daughter Erin unnecessarily died of sepsis when she was 23 years old. Sepsis Alliance gives a voice to the millions of people who have been touched by sepsis – to the survivors, and the friends and family members of those who have survived or who have died. For more information, please visit www.sepsis.org. Connect with us on Facebook and Twitter at @SepsisAlliance.